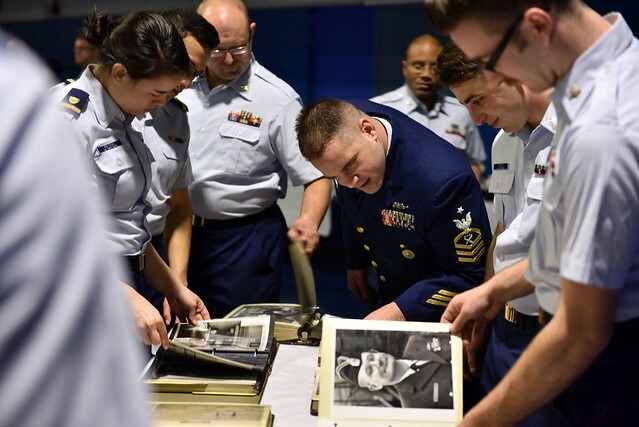 Coast Guard Cutter Mellon crewmembers look through photo albums prior to a ceremony held in the Base Seattle gymnasium on Jan. 9, 2018, which celebrated the cutter’s 50 years of service. The Mellon was designed to help crewmembers perform each of the Coast Guard’s missions including search and rescue, defense operations, law enforcement and environmental protection. U.S. Coast Guard photo by Petty Officer 2nd Class Ali Flockerzi. 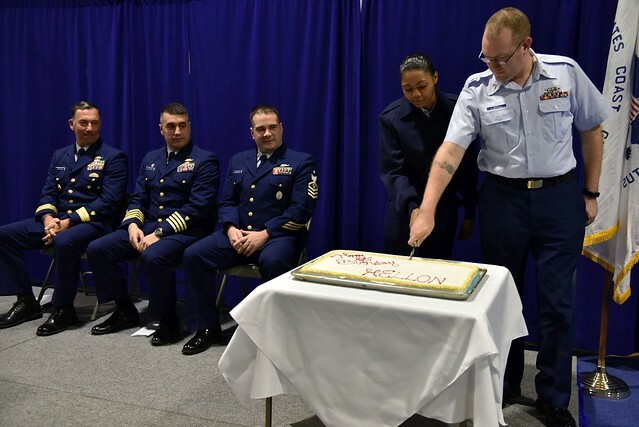 Coast Guard Cutter Mellon crewmembers Seaman Anastasia Whisenton and Petty Officer 1st Class Steven Ross cut a cake during the cutter’s 50th anniversary ceremony held in the Base Seattle gymnasium on Jan. 9, 2018. Along with performing each of the Coast Guard’s primary missions, the Mellon crew conducts Alaskan fishery patrols and enforces international and domestic fishing requirements. U.S. Coast Guard photo by Petty Officer 2nd Class Ali Flockerzi. 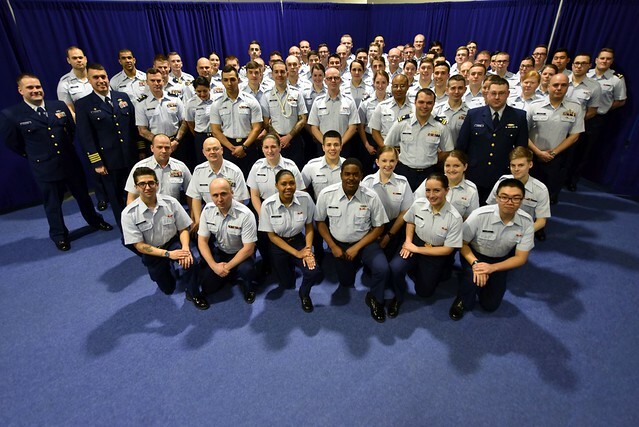 Coast Guard Cutter Mellon crewmembers pose for a group photo after the cutter’s 50th anniversary ceremony held in the Base Seattle gymnasium on Jan. 9, 2018. Named after Andrew W. Mellon, the 49th Secretary of Treasury from 1921-1932, the Mellon’s keel was laid on July 25, 1966 was she was commissioned on January 9, 1968. U.S. Coast Guard photo by Petty Officer 2nd Class Ali Flockerzi.